Those who have heard Anansi stories before already know that Anansi sometimes appears as a man and sometimes takes the form of a spider. So, it makes sense that Anansi and Dog were once good friends. After all, Dog is often called "man's best friend." The two often traveled together and shared everything as they traveled. But one day they both decided to separate to look for good pieces of land to farm. Dog found the perfect piece of land. It had good soil that looked like it was fertile. It had water beside it to irrigate crops if the weather was dry. There were few trees to clear and no rocks to dig up. Dog howled in happiness. Then he went to look for Anansi. When Anansi saw the spot, he fell in love with it too. 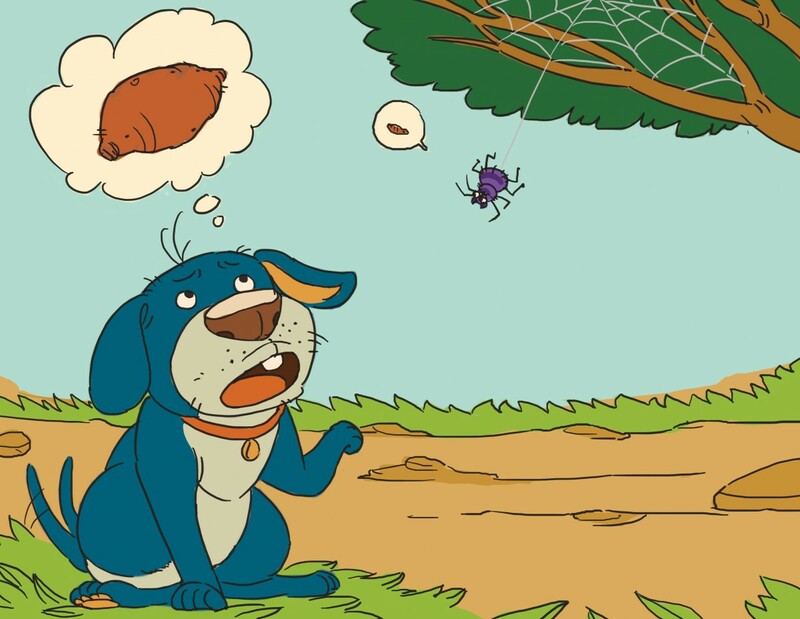 Even though Dog was his friend, Anansi decided that he should have the land instead of Dog. So he said, "My friend, I remember my father planted yams on this very spot, and they were big!" "How big were they?" asked Dog. Before Anansi answered, he grabbed a tree branch above his head and changed into a Spider, and hung on the branch from a single strand of webbing. Then Anansi said, "The yams were the size of my legs." Dog looked at Anansi's legs. They were skinny like threads. After all, Anansi now looked like a spider with thin spider sized legs. Who would want to grow yams so thin? "Before I work land that grows yams so small, I would rather walk around and find another piece of land to farm." And that's what he did. When Dog left, Anansi bought the land. But, instead of skinny yams, Anansi grew the biggest yams that anyone had ever seen. Anansi had not lied. The yams WERE as big as his legs, his HUMAN legs. Dog howled and howled when he found out how he has been fooled. The land he had let go turned out to be the best farm land around. Whevever Dog saw someone eating one of those yams, he was reminded how Anansi cheated him out of buying the rich land. This is why every Dog today still looks to see what everyone is eating. If you own a Dog, whenever you eat, your dog is sure to be looking at every bite that you take. Note: This story originally appeared in Jamaica Anansi Stories by Martha Warren Beckwith in 1924. It is in the public domain as the copyright was not re-registered as required by revised copyright law and may be freely told by others. Beckwith's story story was collected from a Jamaican version of the tale by Moses Hendricks in Mandeville, Jamaica. This version was adapted by Dr. Mike Lockett from those earlier sources.